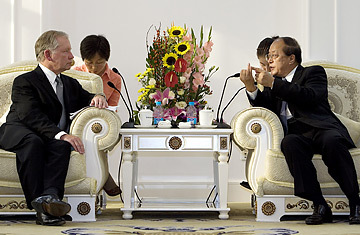 Thomas A. Debrowski, Mattel's executive vice president for worldwide operations meets with Chinese product safety chief Li Changjiang at the General Administration of Quality Supervision, Inspection and Quarantine (AQSIQ) office in Beijing Friday, Sept. 21, 2007. So are toys from China safe or not? If you think you're confused, it looks as if even Mattel, the largest toymaker in the United States, doesn't know. On Friday, Mattel's executive vice president for worldwide operations, Thomas Debrowski, met with the Chinese product safety chief Li Changjiang, to apologize for the company's own weak safety controls. "Our reputation has been damaged lately by these recalls," Mr. Debrowski told Li. "And Mattel takes full responsibility for these recalls and apologizes personally to you, the Chinese people, and all of our customers who received the toys." It's a stunning reversal. In August, after the company announced its recalls of several toys because they were made using lead paint, reporters grilled Mattel CEO Bob Eckert about how lead paint, which is banned for use on children's toys in the U.S., ended up on its "Sarge" toy cars. Surprisingly, he had answers. In a conference call on Aug. 14, he blamed it on a subcontractor who violated Mattel's policies and "utilized paint from a non-authorized third-party supplier." That moment of candor and Eckert's heartfelt apology to parents in a video the company released on Mattel's website were high points in Mattel's otherwise punch-drunk performance in handling these recalls. By pointing out specifically where things broke down and then spelling out what he would do to fix it  testing every batch of toys before it leaves China, rather than relying on testing raw materials  the CEO reassured American consumers that he understood the problem and would back up his apology with action. Eckert is now paying the price for his candor. Mattel needs China just as much as China needs Mattel, and it cannot afford to jeopardize its relationship with the country that produces 65% of its toys. In a global public relations campaign, Chinese officials have emphasized that the country does have strong safety standards, and that problems at a few companies shouldn't be used to paint the whole country's products as unsafe. Even well-regarded Chinese companies with no link to toys or any hint of safety problems, such as brewer Tsingtao and appliance maker Haier, could suffer in the backlash against the made in China label. Technically, Mattel's analysis is correct. Of the 19.6 million toys that it has recalled this year globally, 2.2 million were due to lead paint; the remaining 17.4 million (11.7 million in the U.S.) were toys recalled not because of lead paint but because they were made with super-strong magnets. If they come loose and are swallowed in multiples, those magnets can come together with force enough to tear through the intestines of a young child. (Mattel's announcement noted three such serious injuries that required surgery.) The magnet recall was unusually large because it includes toys sold as far back as 2002, before Mattel changed its design to encase the magnets in plastic to make them more secure. Perhaps it was convenient for Mattel to issue the magnet recall at the same time as its much smaller lead-paint recalls. Or perhaps the company was using an abundance of caution in recalling any toy that might pose a potential hazard. Either way, lead paint in toys from China is not an issue Mattel can correct overnight. That isn't a happy situation for anyone, from families in the U.S. to workers in Chinese factories who face a daily risk of lead poisoning. It will take much more than yet another apology from Mattel to fix that.